Solid brass 10 amp flat plate light switches with matching metal rocker switches and a choice of white or black trim. Intermediate switch also available were a second switch is used to operate the same light eg.landing light. Available in Polished Brass, Satin Brass, Polished Chrome & Satin Chrome. Solid brass 13 amp flat plate plug sockets with matching metal rocker switches and a choice of white or black trim. Solid brass flat plate 2 way, push on/off, dimmer switches, available in 250 or 400 watts. Solid brass flat plate 13A switched spur with matching metal rocker switches and a choice of white or black trim. Solid brass flat plate 45amp cooker unit with 13amp plug socket, with matching metal rocker switches and a choice of white or black trim. Solid brass flat plate shaver socket with dual ouput voltage of 110 and 240 volts, and a choice of white or black trim. Solid brass flat plate TV / Coxial sockets. Non Isolated for use where one outlet socket is required. Isolated for use where multiple oulets with signal amplifier is used, with a choice of white or black trim. 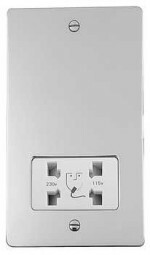 Solid brass flat plate master and extension telephone sockets, with a choice of white or black trim.